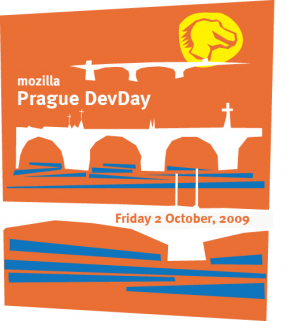 Mozilla is organizing an informal developer-oriented conference in Prague, Czech Republic on October 2nd, 2009. The Mozilla DevDay will be an opportunity for developers, open source enthusiats and web aficionados who live in and around Prague, to meet Mozilla staff and learn about the Mozilla Project and its technologies. The event is free and open to the general public. All sessions will be in english. NB: if you have been invited to attend the Mozilla Camp Europe, please contact William Quiviger (william at mozilla dot com) for information on the possibility to also attend the DevDay. Space is very limited and priority will be given to participants who live in and around Prague. 15:30-16:00 Coffee break with Q & A and Open Discussion Everyone ! In the afternoon, members of the Mozilla Labs will be hosting a 24-hour Jetpack Code Marathon. It starts with getting to meet the virtual Jetpack team, as well as some informal and hands-on lessons in learning to enhance the browser by creating your own jetpack. The hack session will start at 16:00 and last unti 19:00. 24 hours later, the creators of the best jetpacks will have the opportunity to present their work in lightening talks at the Mozilla Camp Europe. The hack session if free and open to all (maximum room capacity = 50). No need to know how to program extensions to participate! If you can write a webpage, you already have the skills needed to write a jetpack. Food and non-alcoholic drinks will be served. Want to help shape the future of the open internet? Then come to Mozilla's two hour Open Web Camp to brainstorm and imagine where the internet is going. Share your ideas about what makes the internet great, how we can make it better and how the world will look in 5 years if we succeed. Learn about future internet trends and challenges from Mozilla executive director Mark Surman, Mozilla Europe president Tristan Nitot and Mozilla Community Ninja Zbigniew Braniecki. Converse with friends over free food and drinks. The meeting starts at 16:00 and will finish at 18:00. It is open to everyone, although room capacity limited to 50 people. The meeting take place at the Angelo Hotel (see below). The IRC channel is #devday on the Mozilla server. The DevDay is a free conference open to the general public. All participants need to register by clicking here. NB: If you have been invited to attend the Mozilla Camp Europe, please contact William Quiviger (william at mozilla dot com) for information on the possibility to also attend the DevDay. Space is very limited and priority will be given to participants who live in and around Prague. The DevDay will take place at the Angelo Hotel. To get to the Angelo hotel take the Metro line B and stop at the Andel station. The hotel is just 5 minutes away. Lunch and coffee breaks will be served at the venue. For participants attending the Mozilla Labs hack session, pizza and non-alcoholic drinks will be served during the hack session. Please use #mozdevday09 for Tweets. If you take pictures of the event and upload them on flickr, please tag them with "mozdevday09". This page was last modified on 2 October 2009, at 12:11.